I have a series a of values (0 and 1) coming from a Brownian process with drift for which I am studying the autocorrelation. I am not very experienced with stochastics or signal processing, so I have some difficulties understanding where the difference comes from. 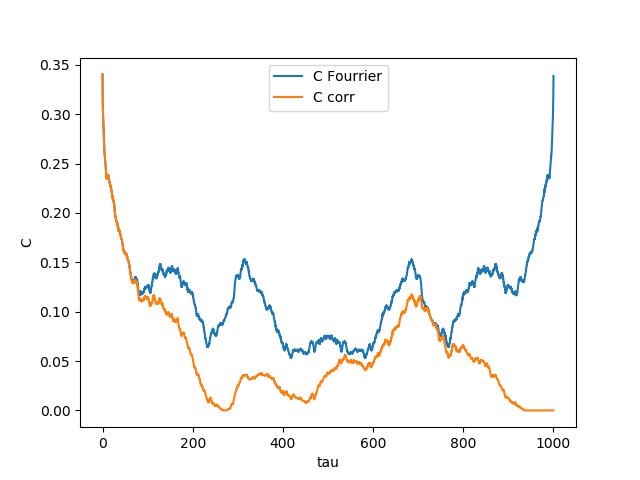 As this page https://ccrma.stanford.edu/~jos/ReviewFourier/FFT_Convolution.html mentions, when you perform cyclic convolution (FFT convolution) you have to add zeros to your signal $A$ to the length $$N_Y = N_A + N_A -1,$$ where $N_Y$ is the length of the output convolution and $N_A$ is length of your signal. In your case you are performing the FFT Correlation, which is almost the same operation and you should extend your signal $A$ with zeros as well. After that you should get the same results as for numpy auto-correlation. Not the answer you're looking for? Browse other questions tagged fft autocorrelation stochastic numpy or ask your own question. Crash course on turning engineering formulae into computer code?